When you need an inventory of your personal belongings in your home it is usually too late. You can try and create one from memory, but you will forget something important and it will cost you money on an insurance claim. Your homeowner’s policy might give you a blanket amount of coverage for personal items of around 40-60 percent of your home’s value. The insurance company will probably ask you for proof of purchase which can be a receipt or a recent inventory of your personal belongings. Even the most organized people will find it difficult to find receipts for the more valuable things in their home. What if you are rummaging through a drawer or closet and discover you have things you totally forget about owning. 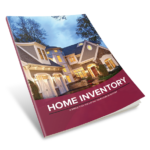 Making a home inventory is like providing insurance for your homeowner’s policy. It will make sure that you have a list of everything possible if you need to make a claim. Go room by room and closet by closet to make the most complete list possible. For closets, shirts, pants, dresses and pairs of shoes can be listed together but high-priced items need to be separate. You can also use photographs and/or videos as proof of purchase. Photograph the rooms, closets, cabinets and drawers. If you decide on video, go ahead and narrate it as you go but go slow enough and close enough to items to get a clear view. For more suggestions and an easy to use, interactive form, download a Home Inventory, complete it, and save a copy off premise, either in a safety deposit box or in the digital cloud if you have server-based storage available like Dropbox or Google Drive.